What’s your loungroom look? Stripy, patterned, textured, simple, miss-matched. ‘Cushions online’. From Middle East master craftsmen. Save time exploring busy homewares stores and go cushion shopping, with your feet up. A ‘cushions online’ search might be just as stressful, so go straight to Lotus Handicrafts. Our kilim crafters make one-of-a-kind cushions, so you can add unique design elements to your interior. Our cushions bring dimension to your living room, bedrooms, kitchen stools, and hang out nooks. Introduce gorgeous colours and textures with these vintage cushions. If you love a minimalist approach to design, your cushion choice is important. You can keep the space simple, celebrating white, with the creative use of ‘moving’ colour. Or, if you like the idea of mixing and matching, we have a range of ‘confident’ tones, like this Stella Vintage Kilim Cushion Cover. Buy cushions online from Lotus Handicrafts. Feel (and see) the quality. Square or rectangle options. Pick your favourite look. Easy online ordering, postage worldwide, fast delivery. Tapestry-woven kilim cushions. Hand-made in the Middle East. Forget flicking through home décor magazines or renovation blogs for inspiration. What you really want is a one-off art piece to add to your interior – not something that’s featured in every photo on Instagram. For distinctive, local designs that fuse modern and vintage styles, it’s kilim. And the Middle East leads the world with quality kilim makers. Kilim respects decorative principles while celebrating an art form that’s been around for centuries. Turn the home into a work of art. Just like you pay attention to how the artwork matches your furniture or the tiles work well with the kitchen benchtops, the same can be said for your cushions. We can easily forget that they’re an important part of our home’s design, simply because they’re small (and interchangeable). But this is also why they’re an important part of interior design. You can make a visual impact without having to spend hundreds. Do you want your interior colours to match the blossoming blooms of spring? 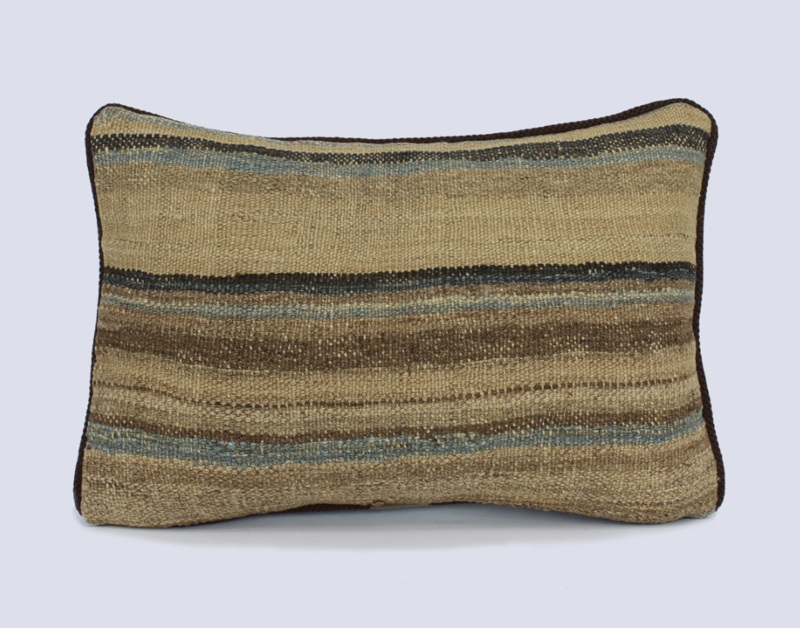 The Anna Vintage Kilim Cushion Cover or the Sophia Vintage Kilim Floor Cushion Cover are great choices. Then, maybe you’d like to tone it down for the cooler months. The Emily Vintage Kilim Cushion Cover or the Alice Vintage Kilim Cushion Cover will introduce subtler, calmer colour mixes. Alongside wall hangings and trinkets, cushions are one of the only interior design pieces that you can update regularly and move around the house, easily and affordably. Every time your girlfriends come over for coffee (or wine), you’re going to receive a cushion compliment. While it’s not fun to crush their interior design dreams when you tell them Lotus only make one version of each cushion (so they can’t get the same one), they will be able to find one perfect for their house. Here’s a great resource to help them navigate their cushion online search, so they don’t get too overwhelmed. If they’re looking for that one-off-type design, you just need to send them straight here. Why Aussies love Middle East designs. The Middle East? I don’t know anything about their designs, you think. But if you’ve ever walked into a homewares store with candles, incense, art, book displays and cushions, chances are you’ve noticed (and enjoyed) a bohemian theme. While we wouldn’t group all Middle Eastern work into this broad category, if you lean towards boho decorating, you’ll love Lotus’ cushions online. So, first, let’s quickly define what boho actually is. A boho (or bohemian) home is full of culture, life and unique items, usually from all over the world. It’s like walking into that treasure trove of a vintage or furniture store. While still modern and sophisticated, a boho theme is carefree, relaxed, and at times, unusual and whimsical. You’ll find objects, colours and patterns from all corners of the globe. You can guess what decorative item often features in a boho-inspired home. The cushion, of course. The key to making decorative materials work is to mix and match. Natural materials with striking designs. This Anna Vintage Kilim Vintage Cushion Cover is the perfect example of a design that’s colourfully-boho, yet warm and classical. It’s a piece of art in its own right. As such, it fits well within any interior living space. Australians houses tend to mirror the culture: carefree, laid-back, outdoorsy and flowery. Kilim fabrics, turned into stunningly timeless, vibrant vintage cushions certainly ‘speaks’ to Aussies more than designs in department store catalogues. Vintage cushions, yet brand new. If you love the vintage cushion look, it can be difficult to know where to hunt for your new range. Furniture stores don’t sell them. You might get lucky browsing an antique and collectable shop, yet there’s something unseemly about ‘recycled’ cushions. No matter how many times you wash them, you can’t seem to get rid of that ‘old’ musty smell. So, your next best option is to look in homewares stores. But still, you find out that the cushion brand produces thousands of the exact same item. Lotus solves both these issues. In our cushions online shop, we sell brand new, vintage-inspired cushions. When you purchase a Lotus cushion, you’ll be the only person in the world with that design. It’ll feel like you’ve flown all the way to the Middle East, perused markets, and brought home the cushion you fell in love with. As for the other important factors like price and comfort, we’ve got that sorted too. You’ll get the benefits of buying your cushions online, like simplicity and discounts, while still being reassured by our returns policy. The nature of the kilim means the cushions are comfortable, but you’ll feel this for yourself. At Lotus, we understand that buying your cushions online isn’t necessarily easier than going to the mall. You know what you’re going to get when you walk around department stores. But, what these stores don’t offer is one-of-a-kind cushion designs. Instead of ‘window shopping’ dozens of different websites for your unique style, the type you’d find in an antique store, come straight to Lotus Handicrafts. You’ll be able to see the quality of our cushions, even in our images. However, if you don’t like how the design looks once you receive it, return it and we’ll provide a full refund. You can read more about our returns policy here. And, in case you’re thinking we’re based in the Middle East, we’re not. Our kilim masters and the rest of the Lotus team operate in Adelaide, Australia. We source all the gorgeous kilim from our people on-the-ground in the Middle East. We scour markets for the most fascinating, premium kilim fabric, then turn it into the new cushion for our customers. While many of our shoppers are in Australia, we can also support cushion-lovers around the globe, via worldwide delivery. Whether you’re a minimalist with an affinity for a dash of colour around the house or you’re more on the playful and daring side with your decorating, you’ll fall in love with Lotus cushions range. Let your ‘cushions online’ search begin and end at Lotus Handicrafts. Oh, and ladies, a word of warning. If you love these cushions, you might want to come up with an ‘excuse’ as to why you need a new bag. We have a wide range of bag designs. The same promise: one bag per kilim design. If you thought telling your girlfriends that there’s only one cushion like this in the world, wait until they see your new handbag. Goodbye shoe addiction. Hello Lotus lover.